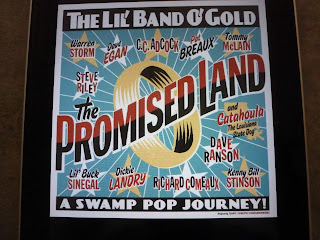 An Australia-only release that provides a soundtrack to a documentary of the same name, The Promised Land delivers a classy collection of tunes that could, generically, be labelled swamp pop, though there are some who might be scratching the old noggin at the inclusion of a cover of ELO’s Hold On Tight as one of the album’s fourteen tracks. Well, you would if you were looking for something that could be slotted into a generic classification as Cajun or Zydeco or whatever, but when you’re talking swamp pop you’re not exactly operating in clearly defined territory. What you’re getting once you head off into swamp pop is, according to Rick Koster’s Louisiana Music, a hybrid that evolved in the early-to-mid fifties at a time when the young folks in ... southwest Louisiana ... were itching to Americanize the French-speaking culture of their parents and grandparents. So you’re looking, in other words, at traditional Cajun (French-speaking white) and Creole (French-speaking black) forms filtered through a rock’n’roll and R&B sensitivity to produce slow dancers or fevered high energy jumping jive. 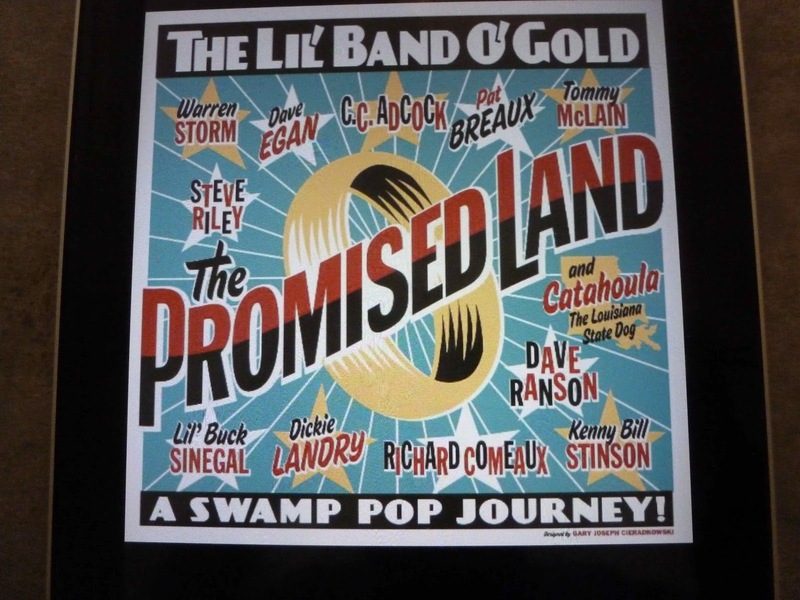 Alternatively, Lafayette swamp popper Gene Terry is quoted in the documentary The Promised Land soundtracks describes it as white guys playing black music damn good. You’ll find Terry written up in Louisiana Music a couple of pages after Lil' Band O' Gold’s drummer (the Godfather of Swamp Pop) right before Johnnie Allen, who gave us the swamp-pop arrangement of Chuck Berry’s The Promised Land that was one of the highlights of a compilation album called Another Saturday Night. If you’re watching that clip I’d point out that today Johnnie Allan is a retired teacher and principal! Singer/guitarist C.C. Adcock and singer/accordionist Steve Riley (Steve Riley and the Mamou Playboys) came up with the idea for Lil' Band O' Gold over pork chop sandwiches at a Creole restaurant in Lafayette in 1998, and the band’s main gig seems to be a Monday night jam at the Swampwater Saloon in Lafayette,so we’re talking an outfit comprised of players whose main gig lies elsewhere and gets together to have some fun. Judging by The Promised Land, they’ve succeeded. Drummer Warren Storm’s CV includes gigs with Slim Harpo, Lazy Lester, and Lightnin' Slim in the '50s, session work with Freddy Fender and John Fogerty and a string of local hits under his own name, singer/pianist and songwriter David Egan has had songs recorded by Percy Sledge, Joe Cocker, and Irma Thomas and bassist Dave Ranson has regular gigs with John Hiatt and Sonny Landreth. There’s also a three-piece horn section, comprising Dickie Landry (Talking Heads, Laurie Anderson, and Philip Glass), David Greely (Steve Riley and the Mamou Playboys) and Pat Breaux (Beausoliel) and pedal-steel guitarist Richard Comeaux to round out the nine-piece outfit. From the opening of Spoonbread to the end of So Long you’re not going to hear anything new, and anyone with anything beyond a nodding acquaintance with the music that has emerged from southwest Louisiana over the years will find much that contains familiar echoes. You might be inclined to go further than describing what’s on offer here as familiar echoes, but we’re talking a revival of a tradition and a desire to revisit the honky tonk environment in from which that tradition emerged, so what might be described as plagiarism in another environment works here as something cut from the same cloth, the way the great Delta blues players borrowed from each other and drew on similar strands of shared experience and influences in common. You’re not going to hear anything startlingly original, but if you’re after something that goes well with beer, good company and seafood on the barbeque this cross-pollination of Cajun folk, pedal steel powered country and R&B might be right up your alley.